Luffy’s epic clash with Baroque Works pirate captain Crocodile continues, while deposed princess Vivi and the rest of the Straw Hat crew race against time to save the ancient kingdom of Alabasta. Just when it seems smooth sailing is ahead, Luffy and crew discover an interloper among their ranks! Who is this former Baroque Works member, and what does she want from the Straw Hats? 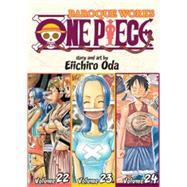 Eiichiro Oda began his manga career in 1992 at the age of 17, when his one-shot cowboy manga Wanted! won second place in the coveted Tezuka manga awards. Oda went on to work as an assistant to some of the biggest manga artists in the industry, including Nobuhiro Watsuki, before winning the Hop Step Award for new manga artists. His pirate adventure One Piece, which debuted in Weekly Shonen Jump magazine in 1997, quickly became one of the most popular manga in Japan.